CLARK AIR BASE, Pampanga -- President Rodrigo Roa Duterte on Tuesday, October 24, enjoined the Philippine Air Force personnel to remain committed to their duties as he vowed the government’s full support to the men and women of the Air Force. 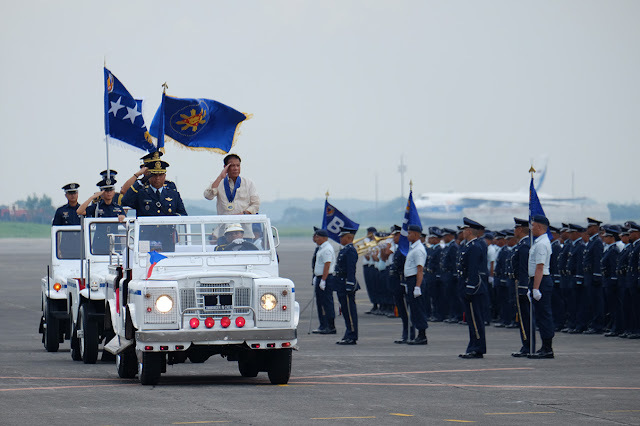 The President led the Philippine Air Force (PAF) Change of Command and Retirement ceremony for outgoing PAF Commanding General Lt. Gen. Edgar Fallorina, who was replaced by Lieutenant General Galileo Gerard Kintanar, Jr. In his speech, the Commander-in-Chief congratulated Gen. Fallorina for his successful tour of duty, noting that PAF had made remarkable organizational improvements under his leadership. “I am confident that the PAF is in good order, with several improvements initiated by Lt. Gen. Fallorina and the upgrades made under his administration,” he said. The President said Fallorina has established the command framework, Jointly Engaged Transforming Force for Greater Peace and Security, and reactivated the Tactical Operations Command and the Air Defense Command. In addition, Duterte said the Philippine Air Force also performed aerial reconnaissance and maritime patrol missions over the West Philippine Sea, the Benham Rise and other parts of the Philippine territory. The Chief Executive likewise lauded the PAF for supporting internal security operations, mostly on the ongoing military operations in Mindanao, where it provided air assets for troop movement and close air support to ground troops against the Abu Sayyaf Group and other local terrorist groups. The Air Force also provided humanitarian assistance and disaster response operations such as aerial observation over calamity-stricken areas and airlift of assisting personnel, relief goods and victims. The Airmen deployed also several aircraft and more than 400 personnel to Marawi City for combat support and troop movement operations. For his part, the President assured that the government would give its full support to PAF as it performs its mandate, citing the two C130s and 12 FA-50 aircraft which were added to the organization since July 2016. He said the government is committed to promote the welfare of all PAF personnel, including their loved ones. “We recognize the valor and the sacrifices of the PAF personnel who were killed and wounded in action, particularly the casualties caused by the conflict in Marawi City,” he said. “That you have left your families and the comfort of your homes to serve the country is truly praiseworthy. Indeed, the Philippines and our people are indebted to you because of the sacrifices you have made every single day,” Duterte said. The Chief Executive meanwhile urged the country’s troops to continue performing their duties well, especially as martial law remains in effect in Mindanao and with the persisting threats of terrorism and insurgency. The President also noted the significant headway made in ridding the country of the scourges of criminality, insurgency, terrorism and corruption.